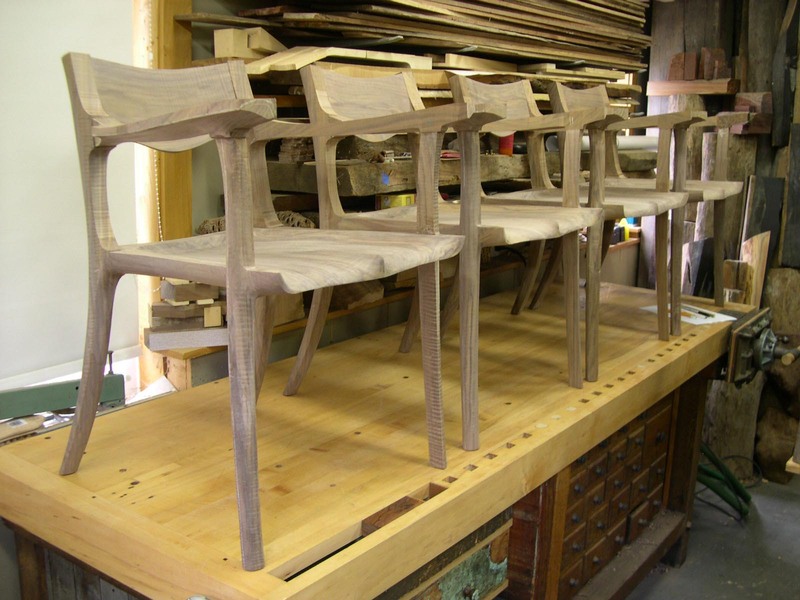 After completing the pair of Norris planes, I thought it would be a good time to take a break and continue working on the dining chairs. It had been almost 4 months since I last worked on them - a lot longer than I had hoped, so I was really looking forward to working on them again. 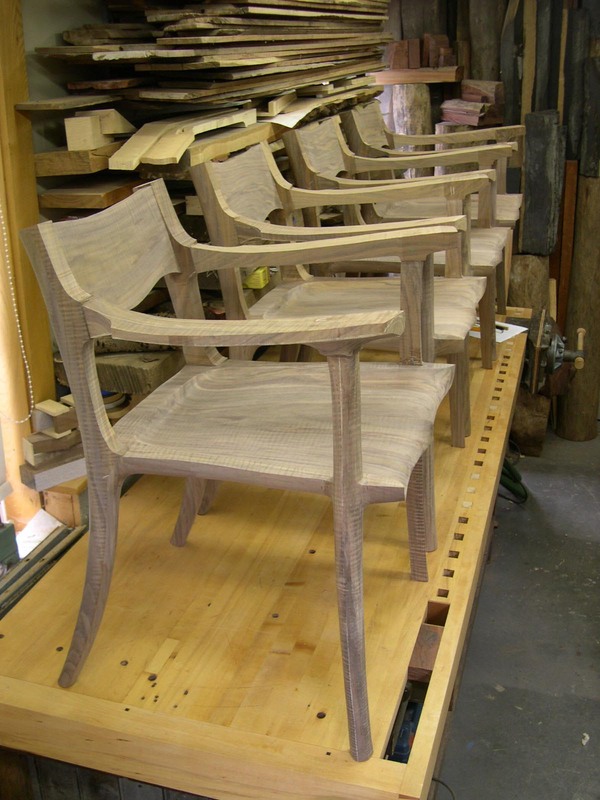 The time in between was not wasted though - it allowed us to use the first completed chair and get to know it. In that time, we concluded there should be 2 alterations made to the remaining 5. The two are related and have to do with the desire to ‘lounge’ in a dining chair after a meal is done. Essentially - this means slouching in the chair. The pommel in the middle of the seat transitions back to where your bum sits, but I should have transitioned it forward at bit more. In other words - left a larger flat spot before the pommel starts. This was a pretty easy change to make. 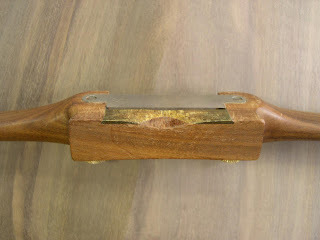 The second change has to do with the crest rail (the back rest). 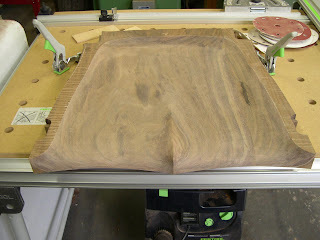 The crest is very flat top to bottom and when you slouch down in the chair, that top edge can feel sharp. I decreased the left to right radius of the crest rail and am going to round over the top edge a bit. I don’t know by how much yet - I have not gotten that far. 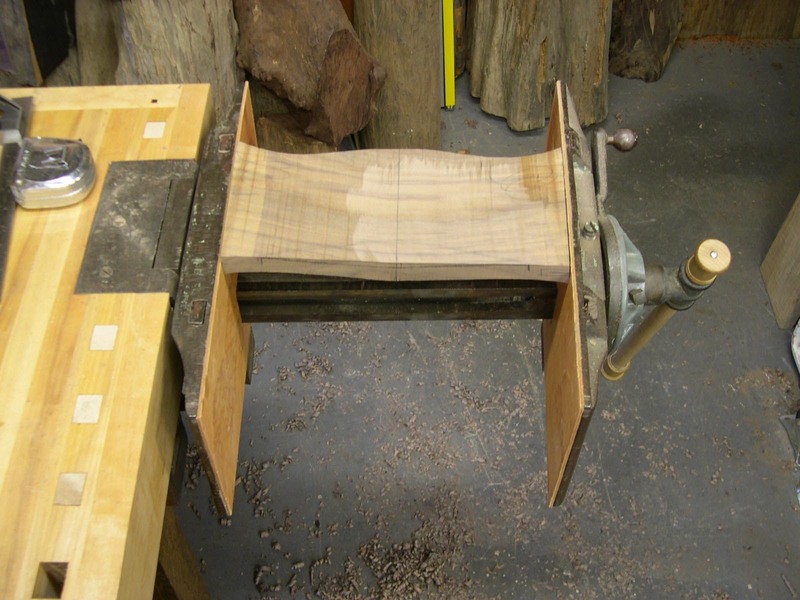 I figured I can reshape the radius on the bandsaw and then glue everything together. I can work on the top edge once I can actually sit in the chair. I took the time to clearly mark all the Domino locations in the crest rail so that I do not remove too much material - that would be disastrous! 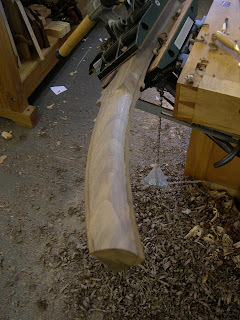 Here is a shot of the crest rail after decreasing the radius (making it more curved). Can I just say - I love my big Emmert! 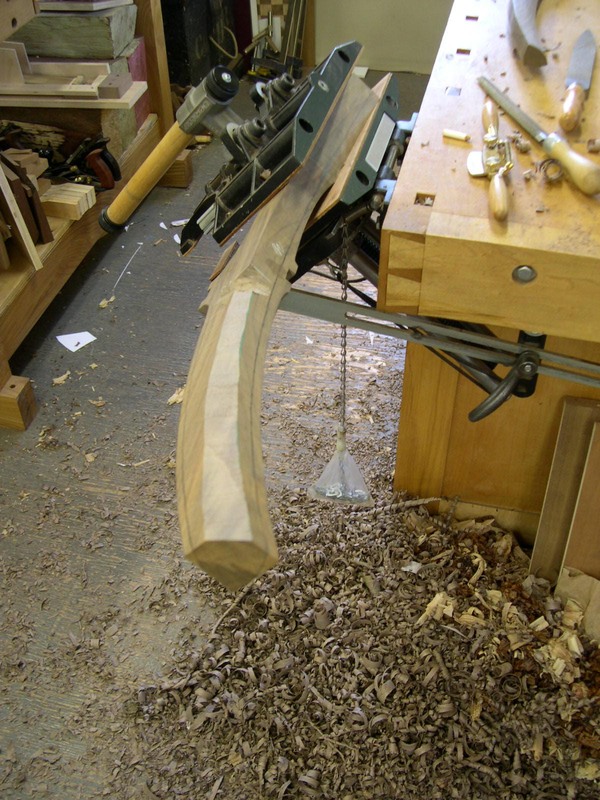 The tilting front jaw allows me to hold just about anything, and work on the entire surface with ease. 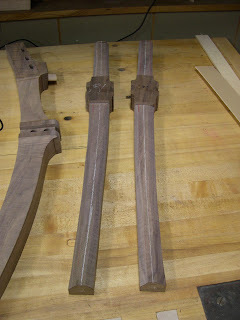 I also did a lot more pre-shaping of the parts before the glue-ups. Above is a shot of two of the arm rests viewed upside down. All this shaping was done on the bandsaw. The bandsaw was also used to knock off the corners of the front and back legs. 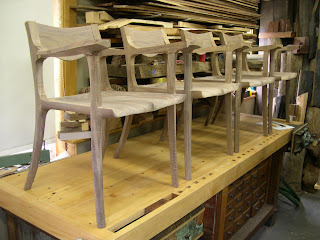 It may not have been obvious in any of the photos of the first chair, but the legs are all triangular in cross section. I love triangles. Not only are they are a really strong shape, they are also very interesting visually and offer some unique shadow lines while maintaining crisp corners. The photo above is the bottom view of one of the back legs. 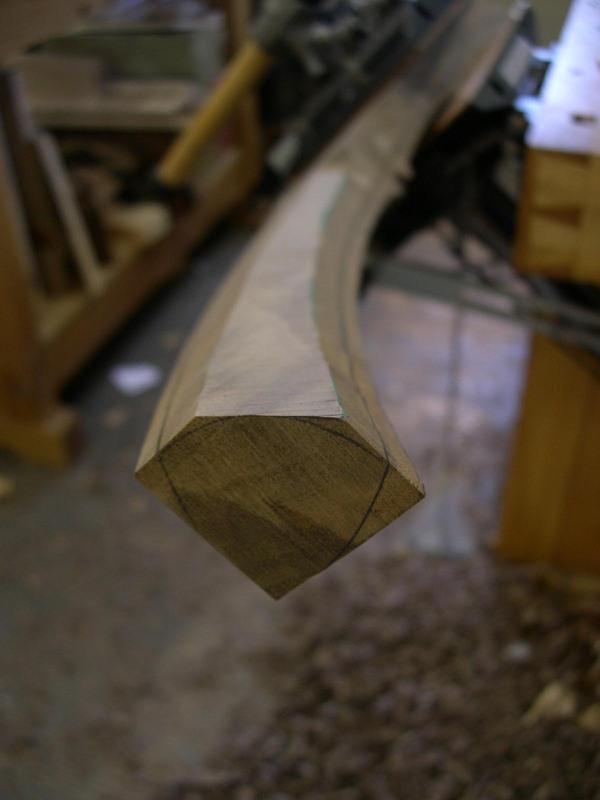 The angled cut was made on the bandsaw. Another view of the setup (note the pattern makers vise... a Tucker from Lee Valley). 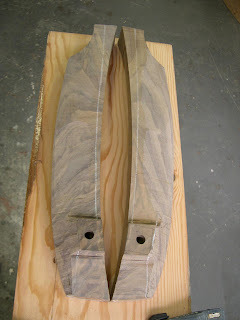 I cannot imagine doing any of this type of work without a pattern makers vise. The first rounded over edge. I used a rasp to cut a quick shoulder just below the seat. 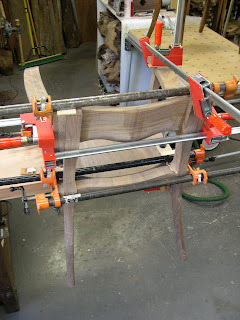 I needed the leg to be left square in this area to allow for the glue-up - you can see it in the photo below. By the second glue-up, most of the fear had disappeared. I hate glue-ups. 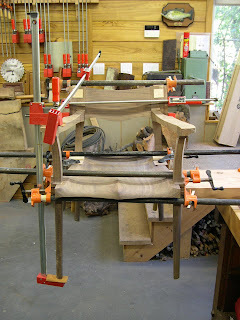 With all the chairs successfully glued up - it was time for the really fun part... the shaping. 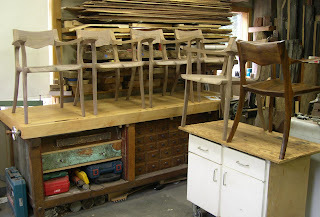 I decided to do the shaping in stages - doing the same area on all 5 chairs and then moving on to another area. I figured this would be the best way to ensure some sort of consistency from one chair to the next. 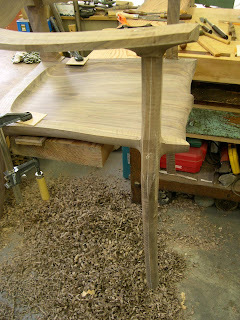 The first area to shape was the underside of the seat. This includes rounding over the underside of the perimeter of the seat. It is amazing how much this lightens the chair visually - it is as transformative as chamfers on a plane. This area also affects all 4 legs so it seemed like a good place to start. 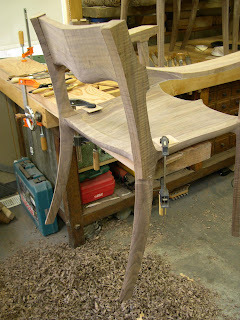 With the underside of the seat done - it was time to start working on the legs. 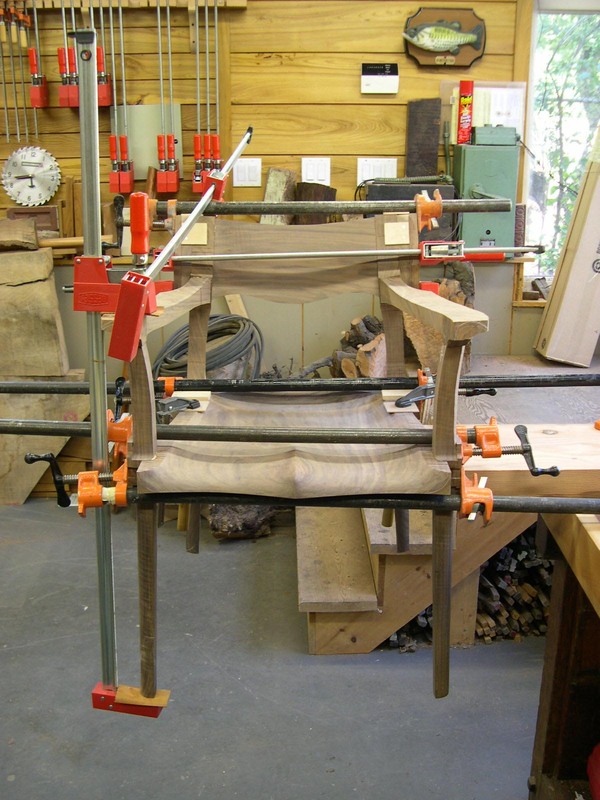 Here is a shot of the chair clamped onto a large, 2" thick piece of Douglas Fir that I have clamped onto a bench. 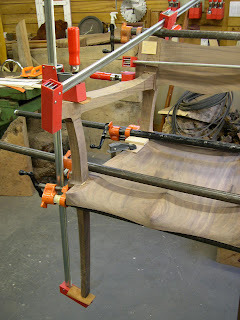 This provided a great auxiliary bench giving me access to 3 sides of the chair. In the photo above, you can see the bandsawn chamfers to the front leg. 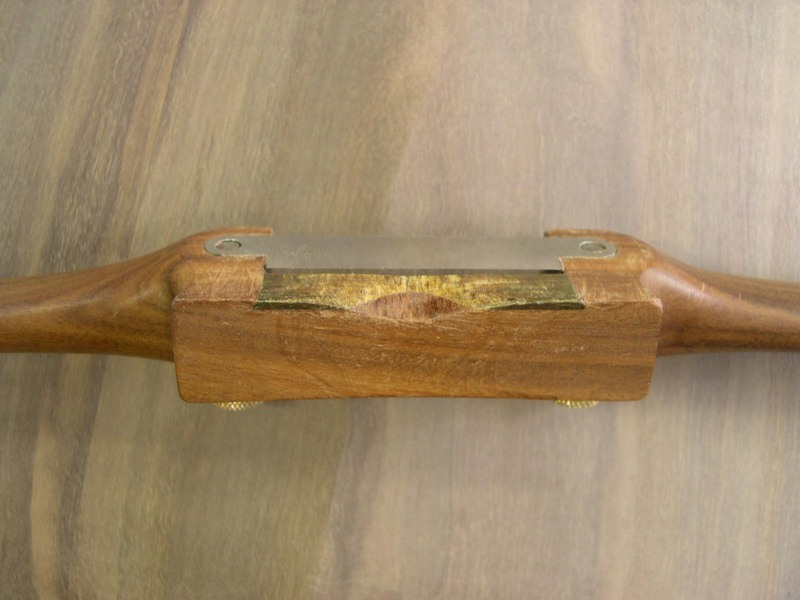 From here, it is all spokeshave and then rasp work. The white pencil crayon line is the center line - this will be left as a crisp edge. The back legs are much simpler because the outside radius is very easy to work on. I did the front legs first to save the easy (read, more fun) back legs for last. Again - it was amazing how much these outside curves changed the appearance of the chairs - they really started taking shape. 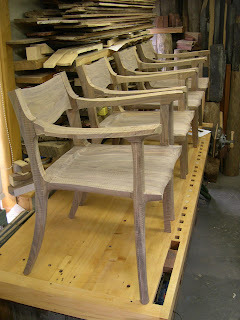 Here are several shots of the 5 chairs all taken to the same level of completion. 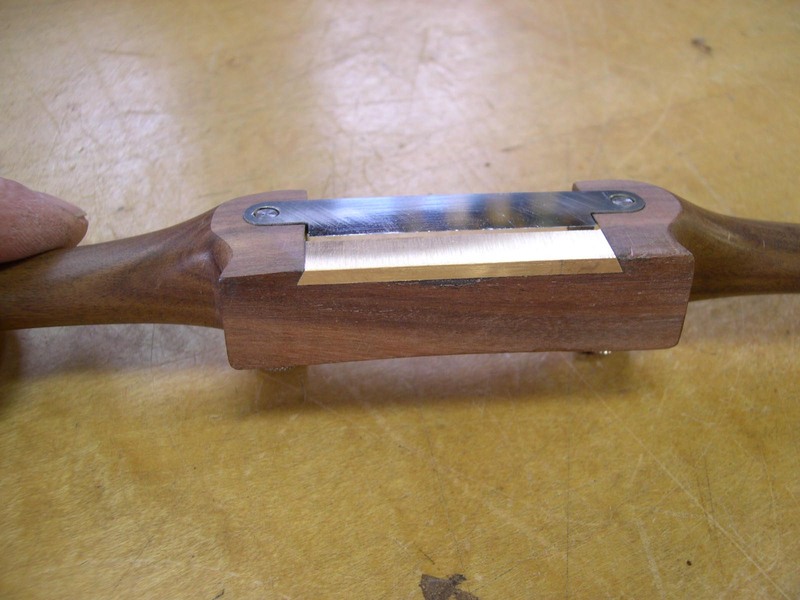 Several years ago I made a few spokeshaves. One was made with hardware from Ron hock and the other from Lee Valley. Both made excellent shaves other than an error on my part. I got all fancy and thought a Lignum Vitae wear plate would be way cooler than a typical brass one. 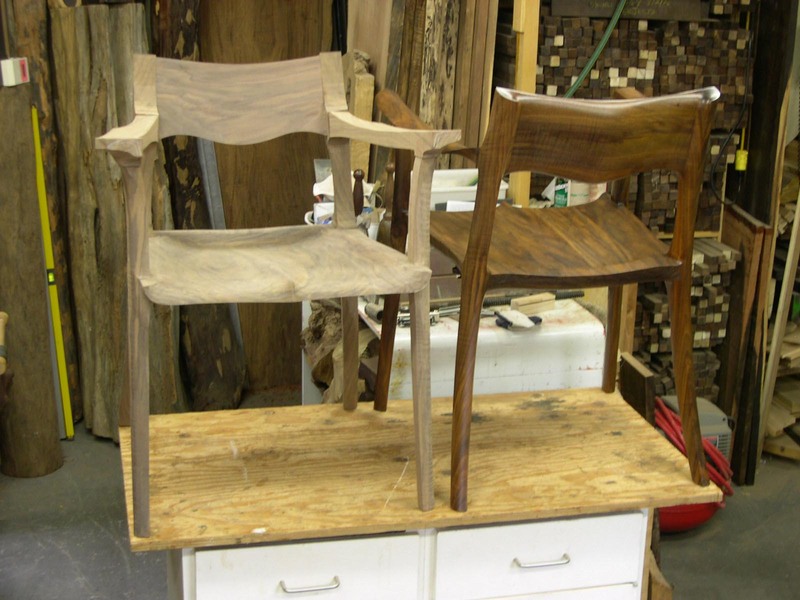 This chair project gave me an appropriate kick-in-the-pants reminder that often those old guys in the past really had figured a lot of this stuff out. My beautifully fit Lignum wear plate was not wearing so well. In fact - it had worn through and was starting to wear into the shave itself. 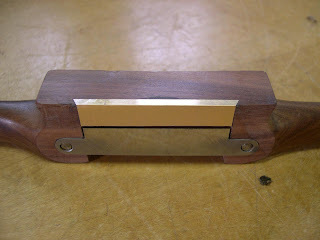 So I begrudgingly cut the remaining Lignum out and fit it with a new, bronze wear plate. At least I still got to be somewhat fancy and dovetailed it in (along with some epoxy for good measure). 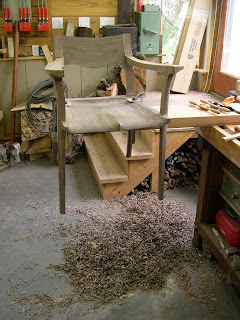 After a week of chairmaking - it was time to return to ‘work’. Which is great really, because I am going to start on the first production K7. It's said Winston Churchill could have been a great painter if he hadn't become the leader of Briton. 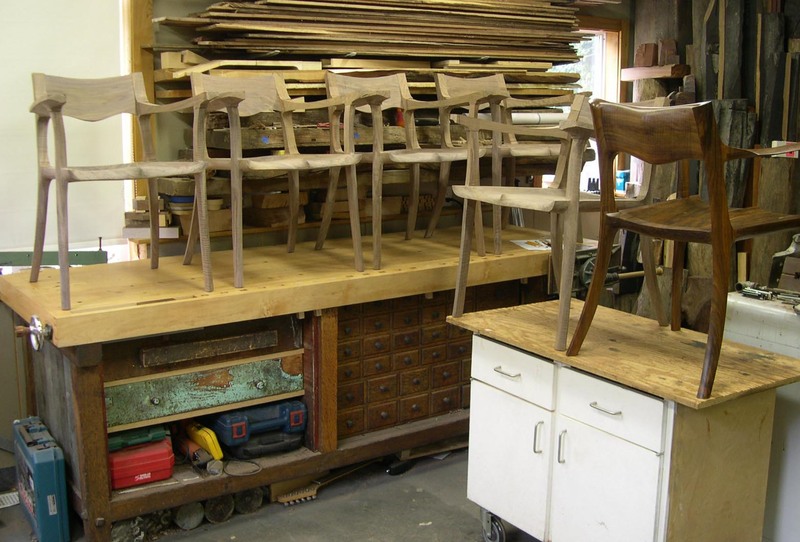 I'm wondering if you couldn't be a great chairmaker if you hadn't persued being an amazing toolmaker. Thanks for the inspiration. Thank-you George - your comment means a lot to me. The curious thing is - I started in design and advertising when I was about 20. I started into planemaking when I turned 30. I just turned 40 this past October. There appears to be a bit of a pattern here - it may be time to transition again. An Emmert and a Tucker, it pains me to realize i have neither. Phenomenal chairs. They look comfortable as well a beautiful. Interesting to see how that Lignum has worn as well. You and me both! I was getting tired of walking by them 97 times a day. Yeah - I know... pretty decadent... but I have to say - they are the best vises I have ever used. I would highly recommend getting one if you can find one. I have found them to be worth every penny. Glad you like the chairs. Thanks David. Yeah - I was kinda surprised at how quickly the Lignum wore down too. Now if the bronze wears down like that, I have a serious problem! very cool chairs! The design is traditional yet contemporary, understated. I would love some day to see these in person. I'm in the middle of three chairs myself, also in walnut, and I feel your pain on those Maloof joints. I spend more time laying out than I do carving them, and mine are by hand.